In an attempt to prolong the Super Nintendo's life, Nintendo of America launched the SNES 2 in 1997, similar to what had previously been done with the NES 2. The SNES 2 was only available in the States and Japan, but was never released in Europe. It was smaller and lighter than the original version, lacking the expansion and RF ports of the old model, although the internal hardware remained exactly the same. The decision to ship the SNES 2 with Super Mario World 2 was rather apt, as the original Super Mario World was part of the original SNES bundle. 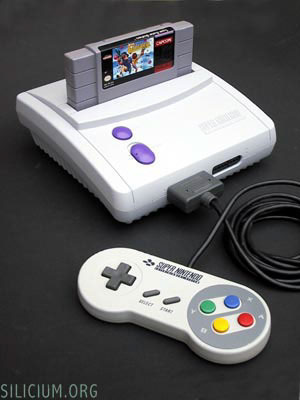 The SNES 2 was released in Japan as the Super Famicom 2. The only difference was the colouring and the cartridge slot. Ultimately, the SNES was outclassed by the new 32 bit systems, and production was halted in 1999.
see more Nintendo Super Nintendo Entertainment System 2 Ebay auctions !